Schizophrenia is a severe psychiatric disease affecting about 1% of the world's population, with significant effects on patients and society. Genetic studies have identified several candidate risk genes or genomic regions for schizophrenia, and epidemiological studies have revealed several environmental risk factors. However, the etiology of schizophrenia still remains largely unknown. Epigenetic mechanisms such as DNA methylation and histone modifications can explain the interaction between genetic and environmental factors at the molecular level, and accumulating evidence suggests that such epigenetic alterations are involved in the pathophysiology of schizophrenia. However, replication studies to validate previous findings and investigations of the causality of epigenetic alterations in schizophrenia are needed. Here, we review epigenetic studies of schizophrenia patients using postmortem brains or peripheral tissues, focusing mainly on DNA methylation. We also highlight the recent progress and challenges in characterizing the potentially complex and dynamic patterns of epigenomic variations. Such studies are expected to contribute to our understanding of schizophrenia etiology and should provide novel opportunities for the development of therapeutic drugs. Schizophrenia is a severe and relatively common psychiatric disease, affecting approximately 1% of the population worldwide . Patients with schizophrenia suffer from three categories of symptoms: positive symptoms (for example, auditory hallucinations and paranoia), negative symptoms (for example, anhedonia and social withdrawal) and cognitive impairment. The disease course typically starts with positive symptoms, and then progresses to a chronic stage with negative symptoms and cognitive impairment. Many patients experience the onset of schizophrenia around adolescence and usually need medication for the rest of their lives. The pattern of symptoms differs greatly between individuals, making the characterization of schizophrenia difficult. Consequently, the societal burden of schizophrenia is also significant. The World Health Organization estimated that schizophrenia contributed about 2% of worldwide disability-adjusted life-years . Although various kinds of antipsychotic medications, such as clozapine and haloperidol, and other psychotropic medications, such as valproate (VPA), as well as social services are useful for the alleviation of symptoms, there are no curative therapies. In addition, antipsychotic drugs are supposed to be effective for the treatment of positive symptoms but not for the treatment of other symptoms. Therefore, it is imperative to decipher the etiology of schizophrenia to establish better therapeutic strategies . Schizophrenia is partly a genetic disease, as evidenced by family, twin and adoption studies . Traditionally, the risk of schizophrenia has been estimated to be up to 46% when both parents have schizophrenia. The concordance rate of monozygotic twins for schizophrenia is 48% and is always higher than that of dizygotic twins . The fact that not all monozygotic twins are concordant for the onset of schizophrenia suggests that environmental factors are also important. For example, viral infection during the fetal period is a well-known high risk factor for schizophrenia . Greater parental ages at the time of birth , reduced nutrition during the fetal period and after birth , perinatal abnormalities , social stress  and other factors [9–12] have also been reported as risk factors (Table 1). Those with a high genetic risk for schizophrenia are thought to be more vulnerable to the environmental factors, a phenomenon known as gene-environment interaction (G × E). For example, people with a family history of psychosis are more likely to suffer from schizophrenia if they have experienced viral infection during the fetal period . Numerous family, linkage and case-control genetic association studies have been performed. Genes such as COMT, DTNBP1, NRG1, RGS4, GRM3, G72, PPP3CC, CHRNA7 and PRODH have been relatively well replicated as genetic factors for schizophrenia [14–18]. Large-scale genome-wide association studies have also identified replicable genetic risk factors, including the major histocompatibility complex (MHC) region, and genes such as ZNF804A, TCF4, NRGN and MIR137 [19–23]. These main implicated genes and loci are summarized in Table 2. MHC, major histocompatibility complex; NMDA, N-methyl-D-aspartate. In addition to these common variants, rare structural variants with large effect size have been identified (Table 2). For example, rare copy number variations (CNVs) in 1q21.1, 15q11.2 and 15q13.3 have been associated with the risk for schizophrenia [24–26]. Increased occurrence of rare CNVs in patients has also been reported . Microdeletion in 22q11.2  and microduplication in 16p11.2  have also been reported as risk factors for schizophrenia. Intriguingly, genes disrupted by rare variants are enriched for neuronal functions such as N-methyl-D-aspartate (NMDA) receptor-related postsynaptic signaling . There is no definitive consensus on the genetic risk factors for schizophrenia, but abnormalities in NMDA-receptor-related glutamatergic synaptic transmission have been suggested as a possible mechanism underlying the etiology of schizophrenia at the molecular level. Although many candidate genes and CNV alterations have been identified as genetic risk factors, the shortcomings of these findings include low reproducibility, low risk ratio, low penetrance, and lack of disease specificity. The heterogeneity of schizophrenia may be one reason for these limitations, but other mechanisms such as epigenetics might also underlie this phenomenon [31, 32]. Epigenetic modifications are roughly divided into two categories: cytosine and chromatin/histone modifications. In mammals, DNA methylation of cytosine residues occurs on the cytosine of CpG dinucleotides, catalyzed by DNA methyltransferases (DNMTs). Methyl-CpG-binding protein 2 (MeCP2) and methyl-CpG-binding domain (MBD) proteins can bind to methylated CpG regions . Chromatin conformation changes in response to histone modifications such as acetylation and methylation. Histone acetylation is a major histone modification, and the process is regulated by histone acetyltransferases and histone deacetylases (HDACs). DNA methylation and histone modifications affect gene expression by changing the profiles of proteins that bind to specific DNA regions; for example, the binding profiles of transcription factors to promoter regions. In addition, DNA methylation on the gene body is thought to affect mRNA processing such as alternative splicing [34, 35]. 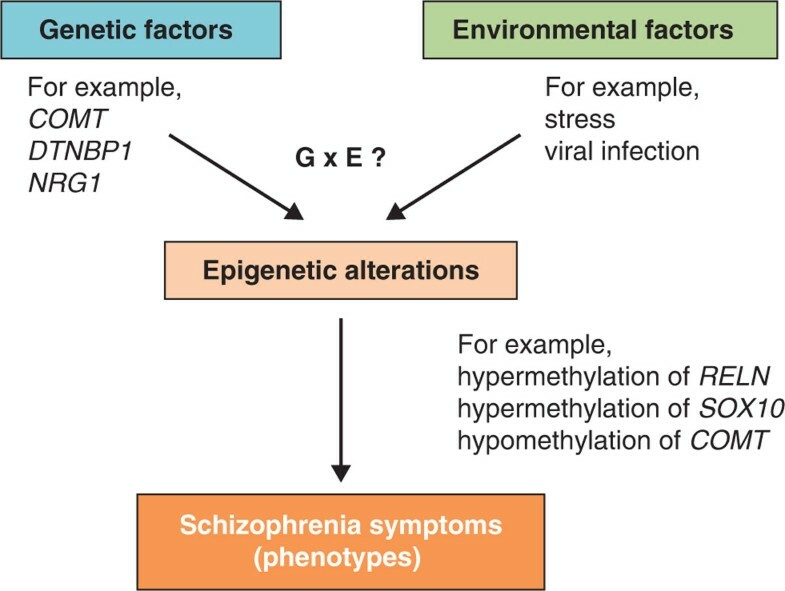 Considering that the epigenome can change in response to environmental factors , epigenetic alterations could partly explain G × E, and therefore could help to explain the etiology of schizophrenia (Figure 1). In this review, we discuss recent studies of epigenetic alterations in schizophrenia using postmortem brains and peripheral tissue samples, focusing mainly on DNA methylation, a critical component of epigenetic regulation. Other forms of epigenetic modification have been reviewed recently [37–40]. We also consider important challenges and future directions in this field. 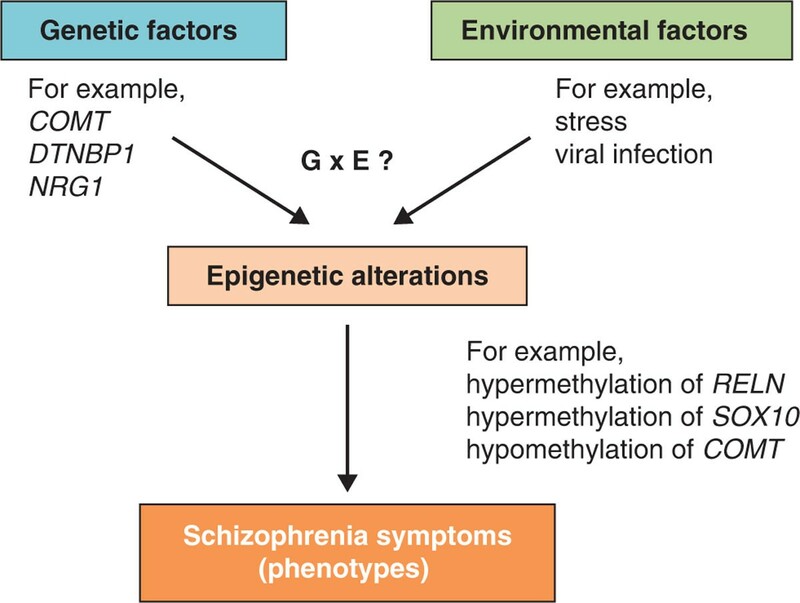 A schematic view of the possible relationship between schizophrenia symptoms, epigenetic alterations and other factors. Genetic factors and environmental factors can affect epigenetic status either independently or through their interactions, and some epigenetic alterations could lead to schizophrenia symptoms. Epigenetic alterations might also partly explain gene-environment interactions (G × E). Examples of genetic factors, environmental factors and epigenetic alterations are shown. The main findings of epigenetic studies on schizophrenia using human samples are summarized in Table 3. In analyzing DNA methylation, one of the traditional approaches is bisulfite sequencing. Sodium bisulfite treatment converts unmethylated cytosine to uracil, but does not convert methylated cytosine. Thus, sequencing DNA after bisulfite modification can allow discrimination between methylated and unmethylated cytosine. Other major approaches include utilization of methylation-sensitive restriction enzymes, antibodies against methylated cytosine, and methyl-cytosine binding proteins such as MBD1 and MBD2. *The limitation of bisulfite treatment (this approach does not allow precise discrimination between various forms of cytosine modifications). CT, normal controls; DZ, dizygotic twin; GABA, γ-aminobutyric acid, MZ, monozygotic twin; SNP, single nucleotide polymorphism, Sz, schizophrenia (patients). Postmortem brains are the most important samples for epigenetic research on schizophrenia, but there are many confounding factors in such studies, including terminal condition (that is, the condition of the samples at death, or their 'agonal state'), cause of death and postmortem condition. In addition, demographic factors such as age, gender and medical history may also affect experimental data. The pH of brain samples, which reflects the agonal state of the subject, is a major factor that affects transcriptome analysis [41–43]. However, Ernst et al. reported that the pH of brain samples has no significant effect on DNA methylation status. Although DNA methylation is thought to be chemically stable, systematic evaluation of the effects of other factors on epigenetic alterations present in postmortem brain samples is necessary. Nevertheless, studies of postmortem brain samples of schizophrenia patients have revealed epigenetic alterations in several genes in specific brain regions, although some findings have not been confirmed by other groups (Table 3). The GABAergic-neuron-expressed genes GAD67 and RELN have been shown to be underexpressed at both the mRNA and the protein level in postmortem brains from schizophrenia patients . GAD67 encodes an enzyme that catalyzes production of γ-aminobutyric acid (GABA), which is a major neurotransmitter of inhibitory neurons. Altered GABAergic neurotransmission has been described in schizophrenia, and GABA receptor agonists, mainly categorized as benzodiazepines, are occasionally prescribed to schizophrenia patients to alleviate anxiety or sleep disturbance, as an adjuvant therapy to antipsychotic drugs. RELN encodes an extracellular matrix protein involved in cell positioning and neuronal migration during brain development. GAD67 and RELN underexpression in the prefrontal cortex appears to be correlated with their promoter hypermethylation [46, 47]. In addition, the gene encoding DNA methyltransferase 1 (DNMT1) was found to be overexpressed in GABAergic interneurons in postmortem brain samples from schizophrenia patients . However, other groups found no correlation between schizophrenia and RELN promoter methylation levels in (pre)frontal cortices [49, 50]. COMT has also been identified as a candidate gene in schizophrenia, and encodes catechol-O-methyltransferase, which is involved in dopamine metabolism. Dopamine is thought to be involved in the molecular pathways underpinning positive symptoms, including hallucinations and delusions. This gene is located on 22q11, and microdeletion of this region has shown strong correlation with schizophrenia . The methylation status of COMT in schizophrenia is controversial. COMT promoter hypomethylation and corresponding COMT mRNA overexpression in left frontal lobes have been reported . However, another group did not confirm the association between COMT methylation levels and schizophrenia in cerebellum, attributing differences in COMT expression to variation in SNPs . We previously reported that SOX10, which encodes an oligodendrocyte-specific transcription factor, tended to be highly methylated in the prefrontal cortices of schizophrenia patients, and this correlated with the reduced expression of SOX10 and other oligodendrocyte-related genes . SOX10 underexpression can result in oligodendrocyte dysfunction with the downregulation of key oligodendrocyte and myelination genes, which has been observed in studies utilizing postmortem brain samples from schizophrenia patients [43, 54, 55]. DNA methylation alterations of other genes, such as FOXP2 (which encodes a transcription factor required for language development)  and HTR2A (which encodes serotonin receptor 2A, one of the main target molecules of antipsychotic drugs) , have also been reported in postmortem brain samples from schizophrenia patients. Mill et al. first performed comprehensive DNA methylation analysis in postmortem frontal cortices from schizophrenia patients, investigating more than 10,000 CpG islands using CpG-island microarrays. They reported DNA methylation changes in genes related to glutamatergic/GABAergic neurotransmission, brain development, mitochondrial function and stress response. Altered histone modifications have also been reported in relation to schizophrenia. Akbarian et al. reported that high levels of H3-(methyl)arginine 17 were associated with downregulated expression of metabolic genes in the prefrontal cortex of schizophrenia patients. Huang et al. reported reduced GAD67 expression associated with decreased levels of trimethylated lysine 4 of histone H3 (H3K4me3), a hallmark of gene activation, in prefrontal cortex samples derived from schizophrenia patients, and suggested that chromatin remodeling mechanisms at GABAergic gene promoters might be involved in the pathophysiology of schizophrenia. Tang et al. reported the underexpression of eight genes, including GAD67 and HTR2C (which encodes serotonin receptor 2C), associated with hypoacetylation at lysine 9/14 of histone H3 (H3K9K14) in postmortem prefrontal cortex samples from young schizophrenia patients, indicating the transcriptional effect of histone alterations on the investigated genes. A number of interesting epigenetic alterations of several important genes, possibly related to schizophrenia, have been identified in postmortem brain samples so far. However, most of these studies involved candidate gene approaches, and more comprehensive analyses of epigenetic changes in brains of patients with schizophrenia as well as the effects of confounding factors such as medication remain to be explored. In contrast to brain samples, peripheral tissue samples can be obtained from living patients with minimally invasive techniques, and this also enables larger and multiple sample collection. Peripheral tissue samples can also be used in longitudinal studies, in order to investigate the course of disease. Although epigenetic status greatly differs between tissue types, brain samples and peripheral tissue samples could have common epigenetic status in certain genomic regions, and thus could be used to identify epigenetic markers of disease. One study reported that COMT promoter methylation status was nearly identical in brain and blood samples in schizophrenia patients . Dempster et al. reported that methylation alterations in ST6GALNAC1 were observed both in peripheral blood samples and in postmortem brain samples obtained from schizophrenia patients. ST6GALNAC1 encodes α-N-acetylgalactosaminide α-2,6-sialyltransferase 1, an enzyme that transfers sialic acid to O-linked N-acetylgalactosamine residues, but its function has not been fully elucidated. Similarly, studies of bipolar disorder also demonstrated that methylation status at specific CpG sites in SLC6A4 (which encodes a serotonin transporter, one of the main targets of antidepressants) and human leukocyte antigen complex group 9 gene (HCG9, which is located within the MHC class I region) showed a common pattern in brain and blood samples [63, 64]. More recently, Davies et al. also reported that DNA methylation differences in blood samples and those in postmortem brain samples were well correlated in the investigated genomic regions, indicating the utility of peripheral tissue samples in studying mental disorders. Several studies have reported epigenetic alterations in peripheral samples (including blood or saliva) from schizophrenia patients; however in some cases the findings have not been supported by work from other groups (Table 3). Leukocyte DNA from schizophrenia patients has been reported to be globally hypomethylated [66, 67]. However, another group reported no global methylation differences between schizophrenia patients and controls , and others have reported overexpression of DNMT1 and DNMT3A mRNA in peripheral blood samples from schizophrenia patients . Given that DNMT proteins promote DNA methylation, these results seem to be contradictory. Interestingly, Melas et al. reported global hypomethylation, especially in patients with early onset schizophrenia (a severe form of disease) compared with controls, indicating a correlation between disease severity and global methylation status. They also reported hypermethylation of S-COMT (which encodes the soluble form of COMT) and no differential methylation of SLC6A4 in peripheral blood cells derived from schizophrenia patients. Other groups have reported hypermethylation of the promoter region of 5HTR1A (which encodes serotonin receptor 1A) in leukocytes , and hypermethylation of the region around the schizophrenia-associated SNP (rs1816071) of GABRB2 (which encodes the β2 subunit of GABA(A) receptor) in leukocytes . Further studies will be needed to understand the patterns of DNA methylation in leukocytes from schizophrenia patients. Altered DNA methylation has also been observed in saliva samples, including hypomethylation of 5HTR2A  (in agreement with a study of postmortem brain samples ), and hypomethylation of COMT  (in agreement with a study of postmortem brain samples ) in saliva from schizophrenia patients. Studies of peripheral samples from monozygotic twins have also revealed interesting findings. Petronis et al. analyzed DNA methylation in the regulatory region of DRD2 (which encodes the D2 subtype of the dopamine receptor) in lymphocytes derived from two sets of monozygotic twins, one concordant and one discordant for schizophrenia. They reported that the affected twin of the discordant pair was epigenetically more similar to the affected concordant twins than to the unaffected co-twin, by analyses of methylation differences at each CpG site . More recently, Dempster et al. analyzed genome-wide DNA methylation status in peripheral blood DNA samples obtained from monozygotic twins discordant for major psychosis, including schizophrenia and bipolar disorder. They found significant DNA hypomethylation in the promoter of ST6GALNAC1 in the affected twins with major psychosis, and this hypomethylation was also observed in independent postmortem brain samples . Recently, Kano et al. reported that olfactory cells of schizophrenia patients exhibited alterations in the expression of several genes, including MGST1 (which encodes microsomal glutathione S-transferase 1), and alterations in H3K4me3 and trimethylated lysine 27 of histone H3 (H3K27me3), which are hallmarks of gene activation and repression, respectively, in the same genes. The utilization of olfactory cells is advantageous in psychiatric research because olfactory cells in olfactory bulbs are thought to share cellular traits with neurons in the brain. Although the precise mechanisms that affect epigenetic status in peripheral tissue samples and their pathophysiological significance in schizophrenia remain unclear, epigenetic alterations in peripheral tissues are useful for development of potential biomarkers for monitoring disease status. Performing more comprehensive epigenome-scale studies using larger sample sizes would be expected to provide further insights into these mechanisms and to facilitate biomarker identification. VPA, an HDAC inhibitor and the best-known psychotropic drug targeting epigenetic mechanisms, is often prescribed to schizophrenia patients, especially to affective schizophrenia patients, as an adjuvant to antipsychotic drugs. It has been actively investigated using animal models. Several groups have reported the therapeutic effects of VPA in animal models with schizophrenia-like behavior or with neglected upbringing, which were associated with modifications in DNA methylation or histone acetylation [76–78]. Here, we focus on studies investigating the epigenetic effects of VPA using peripheral samples from schizophrenia patients. VPA has been reported to induce a significant increase in the levels of acetylated histone H3 (acH3) and acetylated histone H4 (acH4) in lymphocytes. The increase in acH3 levels positively correlated with VPA concentration, and the VPA-induced increases in acH3 and acH4 were found to be smaller in schizophrenia patients . More recently, Gavin et al. [80, 81] reported reduced baseline acH3 levels and elevated dimethylated lysine 9 of histone H3 levels in lymphocytes obtained from schizophrenia patients, which were less responsive to HDAC inhibitors than controls. They also reported that VPA induced a significant increase in GAD67 mRNA levels, acetylation of H3K9K14, and attachment of acetylated H3K9K14 to the promoter of GAD67 in lymphocytes from human subjects, including schizophrenia patients . Taken together, these findings suggest that histone acetylation may be reduced in several genomic regions in schizophrenia patients, and that VPA treatment can increase the levels of histone acetylation in such genomic regions. Further studies on VPA and other psychotropic drugs using human peripheral samples are needed to better understand the relationship between the effects of these drugs on epigenetic status and their mechanisms of action. Most of the previous epigenetic studies on schizophrenia have focused on DNA methylation, but recent research has identified other forms of cytosine modification. The physiological and pathophysiological roles and distribution of such newly discovered cytosine modifications are yet to be understood, but it may be necessary to investigate their importance in schizophrenia. Recent research has also revealed the heterogeneity of DNA methylation patterns between tissue types or cell types, and other types of epigenomic variations, for example during development and aging, which represent additional challenges for epigenetic studies on schizophrenia. DNA methylation had been considered to be chemically stable, but recent research has revealed that cytosine modification is a dynamic process. Recent studies have shown that 5-hydroxymethylcytosine (5hmC) is abundant in mammalian brain cells  and is converted from 5-methylcytosine (5mC) by ten-eleven translocation (TET) proteins . 5hmC might be an intermediate product of active demethylation, although its existence had been considered controversial in mammals [85, 86]. In addition, several other modifications have been described, including 5-hydroxymethyluracil (5hmU), 5-formylcytosine (5fC) and 5-carboxylcytosine (5caC) [85, 87–89]. 5fC and 5caC might also be intermediate products of demethylation [88, 89]. The pathways that might be involved in these cytosine modifications are shown in Figure 2. Cytosine modification pathways. Recent research has revealed that cytosine modifications can be changed dynamically. DNA methyltransferases (DNMTs) catalyze the conversion of cytosine to 5-methylcytosine (5mC). Ten-eleven translocation (TET) proteins catalyze the synthesis of 5-hydroxymethylcytosine (5hmC), 5-formylcytosine (5fC) or 5-carboxylcytosine (5caC). Both 5fC and 5caC are thought to be replaced by cytosine by DNA repair processes such as base excision repair. Thus, 5hmC, 5fC and 5caC are thought to be intermediate products of demethylation. 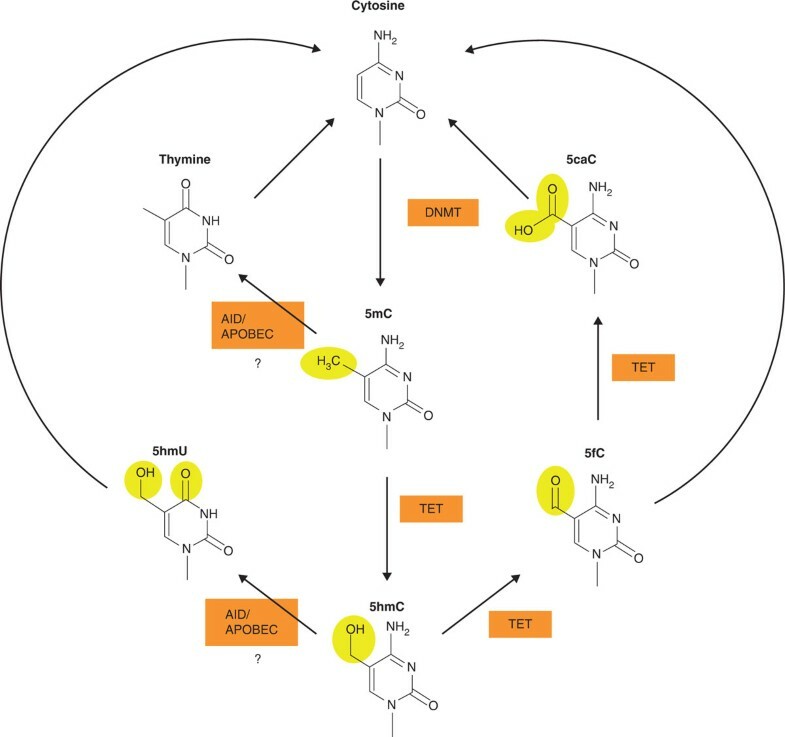 The synthesis of 5-hydroxymethyluracil (5hmU) or thymine is thought to be catalyzed by activation-induced deaminases/apolipoprotein B mRNA editing enzyme, catalytic polypeptide-like (AID/APOBEC) cytidine deaminases from 5hmC or 5mC, respectively. However, recent studies have questioned these reactions . Previous studies of schizophrenia have not provided definitive results on the presence of 5mC or 5hmC, partly because conventional bisulfite sequencing cannot discriminate between these forms. Therefore, studies will be required to investigate their distribution and potential pathophysiological roles in schizophrenia using techniques that can distinguish between these cytosine modifications [90–94]. Epigenetic diversity has been reported to accumulate in brain cells, germ cells, peripheral blood cells and other tissues over time [95–97], although the effects of aging on specific epigenetic alterations are unclear. Hernandez et al. reported that DNA methylation tends to increase with chronological age in the human brain. On the other hand, Heyn et al. reported that aged individuals had less genome-wide DNA methylation in peripheral blood leukocytes than newborns. Numata et al. reported that dynamic changes in DNA methylation occur in human prefrontal cortex especially during the prenatal period, typically with prenatal decreases in methylation and postnatal increases in methylation. Monozygotic twins have the same DNA sequences, except in rare cases such as individual de novo mutations . The epigenomes of monozygotic twins are also more similar than those of dizygotic twins . Although monozygotic twins are epigenetically indistinguishable early in life, they each experience different patterns of DNA methylation and chromatin modifications, thus affecting gene expression in adolescence and adulthood . Recent studies have revealed that monozygotic twins can have significantly different epigenetic status in genes that have been implicated in psychiatric disorders, specifically DRD4 (which encodes D4 subtype of the dopamine receptor), SLC6A4, and MAOA (which encodes monoamine oxidase A, an enzyme that deaminates dopamine and serotonin) as early as ages 5 to 10 years . Epigenetic differences could therefore be one reason for monozygotic twin discordance in schizophrenia [74, 101]. Epigenetic variations could also be partly explained by differences in DNA sequence, such as SNPs and CNVs [100, 105, 106]. For example, Numata et al. reported more DNA methylation in one allele of HLA-DQB1 (which encodes a part of human leukocyte antigen class II molecules, with important functions in the immune system) that contained a SNP (rs1063355) than in the other allele in human postmortem prefrontal cortex samples. In addition to genetic and environmental factors, Petronis argued that epigenetic status, especially DNA methylation, could also be altered by chance . This stochasticity of changes in DNA methylation might also contribute to epigenetic variation and might be an important factor in complex diseases such as schizophrenia. Among human tissues, the brain has a particularly complex anatomical structure with functionally different subregions. Epigenetic differences have been reported across different brain subregions . However, it remains unclear which specific subregions are involved in the pathophysiology of schizophrenia, and there is study bias for regions of the frontal cortex and hippocampus, because these regions have been well characterized in previous research. As well as epigenetic differences at the subregion level, each subregion contains various differentiated cells such as neurons and glia. Extensive transcriptome analyses have revealed that each of these cell types has unique expression profiles [109, 110], implicating the presence of distinct gene regulation, a large part of which could be attributable to epigenetic mechanisms. Using postmortem brain tissues, neuronal and non-neuronal nuclei can be separated by cell sorting based on NeuN, a neuronal marker [111, 112]. Recently, oligodendrocyte nuclei were also successfully separated from other non-neuronal nuclei, using an anti-Olig2-antibody . DNA extracted from the separated fractions can be used for epigenetic analysis of histone modifications and DNA methylation [114, 115]. Interestingly, studies of neurons have shown not only unique DNA methylation signatures, but also higher interindividual variation compared to non-neurons . These results suggest that neurons might be more susceptible to epigenetic variations due to environmental factors. Even analyses at the cell-population level may not fully resolve the epigenetic complexity in the brain, because neurons and glia can be further divided into numerous cell types, and each cell type might have a different epigenetic profile. Although laser-assisted microdissection can be useful when analyzing particular cells, other techniques will be required to analyze the epigenome at the single cell level. Recently, Navin et al. quantified genomic CNVs in a single nucleus by whole-genome amplification followed by next-generation sequencing of flow-sorted nuclei, and Bendall et al. reported the results of single-cell mass cytometry. Furthermore, Kantlehner et al. presented a candidate method for single-cell DNA methylation analysis utilizing methylation sensitive restriction enzymes and PCR amplification. Variation in the epigenome between tissues and cells represents an enormous challenge in epigenetic studies of schizophrenia. Considering that the human brain consists of a larger number of glial cells compared with neuronal cells, it will be necessary to separate distinct cell populations as much as possible when analyzing epigenetic status in brain samples. DNA methylation can be faithfully transmitted from a mother cell to daughter cells during mitosis , but a long-standing question is whether transgenerational transmission occurs during the generation of offspring . Mammalian germ-cell-derived DNA is thought to be fully demethylated in early embryos and in primordial germ cells . However, several recent reports have argued that some epigenetic marks survive in early embryos and remain until adulthood. Two groups studying mice reported that epigenetic alterations induced by social stress could be transmitted to the next generation [121, 122]. Another report demonstrated in mice that parental diet could affect metabolism-related epigenetic status of the offspring . Other groups have reported the existence of transgenerational epigenetic inheritance in nematode and fly models [124, 125]. However, further studies are needed to investigate epigenetic inheritance in humans. If epigenetic alterations were shown to be transmitted transgenerationally, they could partly explain the heritability of schizophrenia. Given that epigenetic status, including DNA methylation and chromatin/histone modifications, affects gene expression, epigenetic alterations could result in functional deficits in brain cells in schizophrenia. Many studies have identified epigenetic alterations in samples obtained from schizophrenia patients, and here we have focused mainly on studies of DNA methylation. However, due to the small sample sizes and technical difficulties, most of the early results were not well replicated . Therefore, the mechanisms underlying the epigenetic alterations in schizophrenia and how these might lead to the symptoms of schizophrenia remain to be understood. To investigate the importance of previous findings, it will be necessary to perform independent replication studies using larger sample sizes. Most importantly, more comprehensive genome-scale analysis using array-based platforms or next-generation sequencing will be needed . Among these technologies, bisulfite-modified whole-genome sequencing approaches have been utilized for methylome analysis at base pair resolution [35, 128]. Recent studies have revealed complex and dynamic patterns of DNA methylation in the human brain. It will be important to investigate various cytosine and histone modifications in specific brain cell types to understand their potential roles in the pathophysiology of schizophrenia. Recent technologies that can discriminate between various cytosine modifications on a genome-wide scale [90–94] as well as cell-sorting-based analysis [113–115] will empower further characterization of cytosine modifications in brain samples of schizophrenia patients. Previous research using human samples has shown only associations between specific epigenetic changes and schizophrenia, so it remains unclear whether the identified epigenetic alterations are the causes or the results of schizophrenia pathology. Several groups have reported changes in gene expression associated with epigenetic alterations, but further studies are needed to examine these relationships. After careful and extensive replication studies, the relationship between candidate epigenetic alterations and schizophrenia pathology must be validated using cellular and animal models. Methods for site-specific epigenetic engineering could be used to investigate causality [129, 130], although these technologies are still immature. If causality between epigenetic alterations and schizophrenia was demonstrated, therapeutic drugs could be developed by searching for molecules affecting the target epigenetic alterations . In conclusion, despite many challenges regarding the approaches for sampling and detection of epigenetic alterations, epigenetic studies are expected to contribute to our understanding of the pathophysiology of schizophrenia and should provide novel opportunities for the development of therapeutic drugs. This work was partly supported by funding for research (Development of biomarker candidates for social behavior) carried out under the Strategic Research Program for Brain Sciences and Grant-in-Aid for Scientific Research on Innovative Areas (Unraveling the micro-endophenotypes of psychiatric disorders at the molecular, cellular and circuit levels) from the Ministry of Education, Culture, Sports, Science and Technology of Japan.